This one goes into the “too cool for words” category. 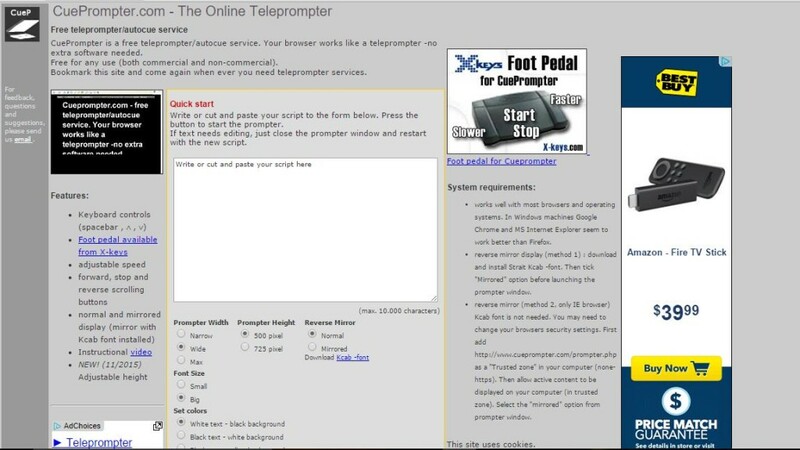 Nonetheless, I shall try to come up with some words to tell you about the incredible free online teleprompter I just discovered. It’s called Cue Prompter and it is not only free, it’s extremely easy to use and has all the basic features you’ll need in a teleprompter. Using a teleprompter will make your talking head videos so much better. 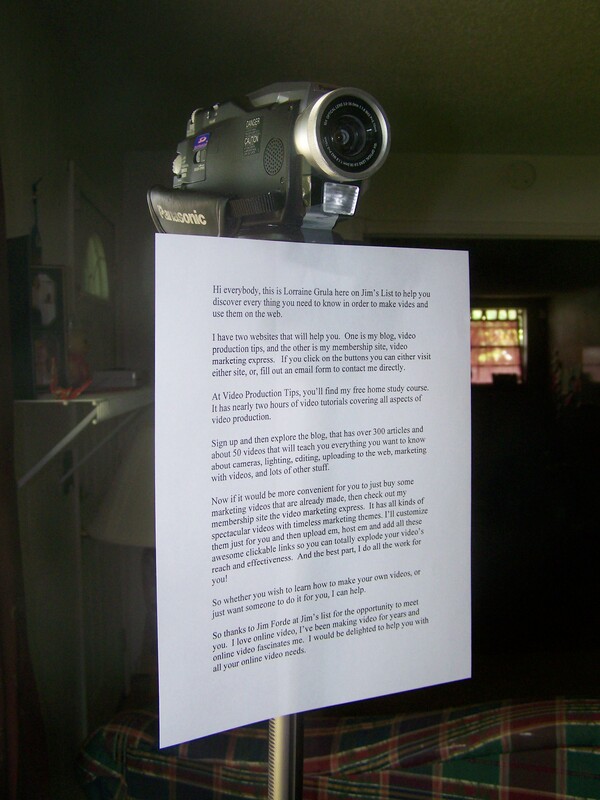 With a teleprompter, you do not have to memorize your script. You’ll be able to stare straight into the camera while the words of your script float effortlessly by. Using a teleprompter makes your talking head video look professional. There is not a professional TV person on the planet who does NOT use a teleprompter. Until I found Cue Prompter, I would use various tricks like scotch taping a script to the bottom of the camera. That is certainly better than trying to memorize your script, but that method leaves a lot to be desired! For one thing, viewers will notice that your eyes are drifting downward as you speak. I’ve also used my computer as a teleprompter while using the webcam. This method works fairly well, but te words do not advance by themselves and if you try and do it, your eyes will surely drift. With Cue Prompter, the moving words let you keep your eyes up at camera level. Cue Prompter is like a professional teleprompter in every way, except one. Cue Prompter is FREE! A “real” teleprompter isn’t! Next time you’re wanting to make a talking head video, check out Cue Prompter. I hope this information helps you make better videos! As usual, another practical tip. I checked out the teleprompter and can see how useful it will be. Thank you for letting me know about it. So good to hear from you! I absolutely LOVED the online teleprompter. Handy dandy tool indeed! One of the best things ever and you can’t be free. So easy to use All the bells and whistles one could ever need. Unbeatable. Thanks for your comment. Great source, Loraine. So, you’ll be looking at a laptop screen for prompts. Best location for laptop is?? Or did I miss something. Teleprompters are always located directly beneath he camera, as much directly in front of it really as the situation will allow. The large, expensive ones have mirrors and glass that actually do go in front of the lens. You can not block the view of the camera of course, but you want the on-camera person to appear as though they are looking straight into the camera. So a situation like this online prompter assumes you have a web cam on the top of your laptop. If you are not using a webcam, then you can have your tripod peaking over the top of your laptop. Thanks for your comment and I hope this helps. I should have made this more clear in the article, my apologies!